I have just returned home from one of the most worthwhile, life-changing, yet surreal weekends of my life. 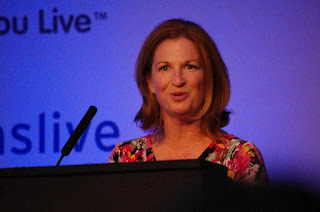 I have been to the blog writers' conference hosted by BritMums Live in London. I signed up and set off with my student hat metaphorically pulled on hard, my notepad and pen in hand and my brain set to 'absorb' mode. I knew this was going to be a huge learning curve for me as a newbie blogger, technical numpty and country bumpkin, so I decided to put as much into it as I could... for you always get out what you put it in life. I was actually a finalist in the Inspire category of the Brilliance in Blogging Awards. Quite frankly, this terrified me. The other women in the category were accomplished, polished writers with far more worthy messages than mine to spread. I felt like a fraud in part. As the Friday progressed I became more and more fearful. I knew not one soul. I didn't know what to expect, what awaited me, and I really didn't want to sit at the front with the other nominees that evening. That evening I attached myself to fellow finalist @KateonthinIce's side, with a large glass of bubbles in hand. When @MummyWhisperer won our category, I was overjoyed for her and her funny, accomplished blog. Selfishly too I was relieved that I could now sit back and enjoy the company of the amazing women I had met that day. For I had been asked to read one of my blog posts as part of the keynote speech at the close of the event. This was the biggest opportunity of my lifetime. I knew that I only had a few minutes to engage a captive audience and leave them thinking differently about Down's Syndrome. I knew I had to get it right. There would be hundreds in the audience, so I had to conquer my nerves and think of the bigger picture. I decided that I would ditch my usual jeans and unattractive wellie-shoes look, in order to make an impression. The un-madeup, ponytail-wearer would have to shout loudly in the face of subconscious ideas of what a mother of a child with Down's Syndrome looks like. So, a new shorter hairdo was adopted, nails were stained a flash of shocking pink, and I dug out some sky high stilletoes to match, that had once been worn to a wedding long ago. I slapped on some makeup and prayed that I wouldn't fall over my heels on the way to the stage. This had an amazing effect. For although I had simply planned to show the world that Mums with children with disabilities are not, by definition 'Frumpy Fuddy Duddies' (I quote Frankie Boyle), it was like putting on a uniform. I became an even more confident version of myself. I knew I could speak loud and proud. Once I had reached the stage an inner voice took over. I began to read What To Say When a Baby is Born with Down's Syndrome. Every single ounce of emotion I had felt at the time of the episodes I was reading about came flooding back. The inner voice quaivered and cried, but I knew in a moment that you were all listening to me, feeling the emotions with me. I felt as if I were talking to old friends, people on my side, and there was nothing to fear in cracking a little here and there. Once or twice I had to stop and take several deep breaths before repeating my tearful words more clearly, feeling a sense of desperate urgency that none of them should remain unheard. My fingers numbed, then my hands, probably from the mixture of fear, adrenaline and deep breaths. I began to realise that I would need to get to the end of the speech swiftly before I passed out. Then I spotted people crying with me, lots of people. My inner voice smiled, feeling carried forward by the support and love in the room. When I finished, my body shaking wildly by this point, I stepped away from the podium. Out of the corner of my eye I spotted one or two people stand, clapping. I turned and looked up to see the entire hall rising in a wave. This was a standing ovation. People had put away their smart phones and listened. They had connected with the words. They had cried with me because what I had written was for every single one of them in the room. @AllforAlenya came forward and helped me to my seat, hugging me until I stopped crying and shaking. The shock still hasn't stopped and tears keep filling my eyes when I think of that evening. The pride will always be there. Thank you all for giving me the opportunity to talk to you. And thank you for helping me to gently change perceptions of Down's Syndrome from within hearts. I am so proud too that others have written about their experience of listening to the reading of What to Say When a Baby is Born with Down's Syndrome and what it meant for them. Hi Hayley, I was there listening to you read, it was such a powerful moment. It was a privilege to be there. Thank you for sharing that incredible post. You have helped so many of us to be the best support we can if we're in that situation, which is completely what we would want to be, but perhaps it would not have come out right. Sharing your point of view and your experiences of that time gave an incredible insight. I wasn't sure whether to stay on Saturday, but I decided to come and listen to a few of the speeches - I could always leave it it was boring. And I'm so glad I did! I thought your reading was amazing - mostly because it was so personal and honest. It's so brave of you to stand up and recount such a difficult time for you and your family - and talk openly about the good and bad of peoples reactions. I found you extremely inspiring - and have been telling people about you since I got home! Hi Hayley, I blubbed along with the rest and wished to God I'd have read your post when a friend had a baby with Downs. I was struck dumb with the fear of saying the wrong thing when all I should have said was 'Congratulations'. Thank you so much for educating me and a for baring your soul so we could understand better. This made me well up all over again! 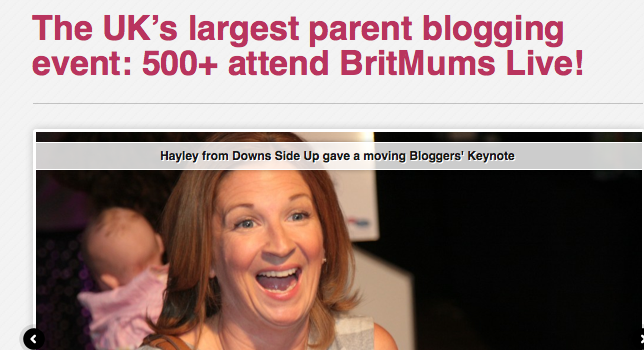 Hayley, you were one of the highlights of britmums for me and I thought you also looked fantastic! Your standing ovation was so thoroughly deserved. Your reading was the point of the weekend. I was so moved. And I have mentioned your reading, aswell as many others, in my Brit Mums write up. It was wonderful to be introduced to your blog by your powerful and inspiring story. Thanks for sharing - your reading was the highlight of the Bloggers Keynotes and the highlight of the conference for me. I was crying, and clapping, and standing .....all at once! Wish we had met up ---- next year! It was an amazing moment, a truly beautiful post and everyone was so captivated by your words. Thank you for sharing it. What can I say? You know I love you. So pleased we met and hope the connection lasts for a long time yet. I knew I would stand even if I was the only one in the room who did. Have never felt that before in my life. Here's to you, amazing lady. I hope this has spurred you on to keep blogging, and to realise your message is important. It's not a message about Downs Syndrome, though that of course is important. You are here to teach us acceptance of difference, the beauty in all children, and that whatever life throws of us we can make something brilliant and beautiful. I feel honoured to have met you and look forward to supporting you and your blog for years to come.